You may have noticed that over the last couple of months, I haven't been writing too much about text mining. So I got sidetracked a bit - there's life beyond text mining, y'know :-). In any case, I am back on track to working through the remaining chapters of my TMAP book. This week, I describe a summarizer application built using Lucene. Summarization involves reading a body of text, and summarizing it in your own words, and if done algorithmically, requires a fair amount of AI code and domain knowledge (about the text being summarized). Having seen this in action (as a consumer of the end product) at my previous job at CNET, and I can tell you that a lot of work goes into something of this sort. My goals are far less ambitious - I just want to find the "best" (most relevant) few sentences from a body of text and call it my summary. A similar approach is taken by the two open-source summarizer applications I looked at, namely Classifier4J (C4J) and Open Text Summarizer (OTS). Based on reading this Linux.com article describing OTS and using it a bit, and looking at the sources for C4J's SimpleSummarizer, I realized that I could pick up good ideas from both applications and build one myself. For example, OTS uses XML files to specify grammar rules and a dictionary of excluded words, which could be implemented using a Lucene's PorterStemFilter and StopFilter respectively. Classifier4J tokenizes words and uses an in-memory HashMap to store a word-frequency map, which Lucene provides using its the terms() and docFreq() methods of IndexReader. My LuceneSummarizer tokenizes the input into paragraphs, and the paragraphs into sentences, then writes each sentence out to an in-memory Lucene index. It then computes the term frequency map of the index to find the most frequent words found in the document, takes the top few terms and hits the index with a BooleanQuery to find the most relevant sentences. The top few sentences (ordered by docId) thus found constitute the summary. The summarizer code is shown below - referenced classes are described further down. * return the top few sentences found ordered by Lucene document id. * @param analyzer the analyzer to set. * The number of sentences required in the summary. Default is 2. * @param numSentences the number of sentences in summary. * This value specifies where to cutoff the term list for query. * a frequency greater than topTermCutoff * topFrequency. *        an appropriate value (such as 0.5). * and then no more deboosting occurs. *        0 and 1. Default is no deboosting, ie sentenceDeboost == 0. * stop. Default is set to 0.5 if not set. Must be between 0 and 1. * @param sentenceDeboostBase the sentenceDeboostBase to set. * expensive to set up, therefore we set them up once and reuse them. * and calling init() on it to instantiate its expensive objects. * @return the summary in the specified number of sentences. * appropriate document boosts if specified. * @param ramdir the RAM Directory to use. * @param text the text to index. * summarizing by skimming the first few sentences off a paragraph. * @param paragraphNumber the paragraph number (0-based). * @param sentenceNumber the sentence number (0-based). * @return the deboost to apply to the current document. return (deboost < sentenceDeboostBase) ? * Computes a term frequency map for the index at the specified location. * top term, where the topTermCutoff is number between 0 and 1. * @param ramdir the directory where the index is created. * @return a Boolean OR query. * is preserved in the collection). * @param ramdir the directory location of the index. * @param query the Boolean OR query computed from the top terms. * @return an array of sentences. * import them on analyzer construction. The nice thing about using pre-built Lucene components is that they can be easily extended by adding new filters into the chain. For example, if we wanted to restrict our terms to be of a certain part-of-speech (say nouns), then it is quite simple to build a POSFilter that would use either the Wordnet database or a rule-based tagger such as Brill tagger. One strategy used by human summarizers is a strategy called skimming that involves reading the first paragraph fully, and then reading the first few sentences from each of the succeeding paragraphs. 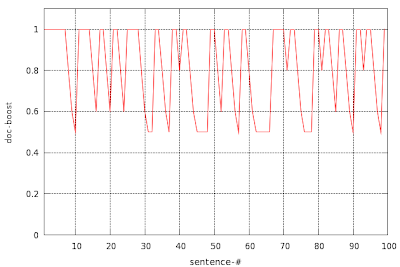 Our LuceneSummarizer models this using a linear function that is applied to sentences after the first paragraph. This results in successive sentences (from the second paragraph onwards) to be treated as less and less important, until it reaches a floor, at which point successive sentences in the paragraph get the same importance. The graph below is the actual boost values from one of my test cases, and should help visualizing the behavior of the above function. To model the heuristic described above, I needed a paragraph tokenizer and a sentence tokenizer. I first tried using my old SentenceTokenizer based on Java's BreakIterator, but it would not recognize a line break as a sentence boundary, so I modified it to use the RuleBasedBreakIterator (RBBI) with default sentence break rules from the ICU4J project. That worked better, except that it would break over abbreviations such as "Mr." terminated by a period, so I had to put in a rule to suppress the break. I describe the SentenceTokenizer first. As described here, I generate my default rules by dumping the rules from a sentence instance with RBBI.toString(). However, I had basically gotten lucky when customizing the RBBI for word tokenization - this time around, I really needed to understand the default rules, so looking through the commented sentence rules source file and the Unicode spec upon which it is based was practically mandatory for doing any customization. My rule file, including my $AbbrevWord rule, is shown below. Along with my own comments, I pulled in the source file comments as well, so its fairly easy to understand. # For a description of the variables involved. # Character categories as defined in TR29 (see URL above). # Rule 3 - break after separators. Keep CR/LF together. # followed by a number or lowercase letter. # continuation punctuation such as comma, colon, semicolon, etc. # punctuation, trailing spaces and paragraph separator (if present). The code for the SentenceTokenizer is almost unchanged, the one difference is that we instantiate the BreakIterator differently. Instead of using a static sentence instance, we instantiate the RBBI from the sentence rule file. The choice of RBBI over the Java's BreakIterator also resulted in the additional init() method, where I instantiate the Paragraph and Sentence tokenizers, since they need to compile the rules on startup, and are hence expensive resources to instantiate. * with rule file adapted from a dump of RBBI.sentenceInstance. Neither Java's BreakIterator nor ICU4J's RBBI provides a paragraph iterator, but it is fairly simple (once you understand the rules) to modify the sentence rules to not break on certain separators and thereby create a set of rules for paragraph tokenization. Here is my file containing rules for paragraph tokenization for RBBI. # on STerm (sentence terminator) and ATerm (ambiguous terminator). # more lenient to allow paragraph tokenization. And here is the code for ParagraphTokenizer. It is quite similar to the SentenceTokenizer, the only real difference is that it is created using a different rule file and that it exposes a nextParagraph() method instead of a nextSentence() method. * the RBBI sentence tokenizer. My test case has code to run the C4J summarizer as well as my LuceneSummarizer. I used OTS as well on the command line and pulled out the first 2 sentences of the summary. Here is the code for the JUnit test. It tries to summarize, using C4J and then this LuceneSummarizer, three files from different Internet sources - I have manually cut and pasted the text content of these pages into local files, so I don't have to worry about HTML parsing for now. For testing, I used the text (content cut-n-pasted from the web page to local disk) of three web pages. Results are shown below. One of my own posts Over the past few weeks, I've been looking at various (Java and Scala based) Actor frameworks. Taking the println() calls out from both the Scala and the Jetlang examples improved the performance of both significantly, and the Jetlang example ended up with lower elapsed time numbers than the Scala examples. ... Over the past few weeks, I've been looking at various (Java and Scala based) Actor frameworks. ...Mike was kind enough to take a look at the Jetlang code, and he suggested that the excessive amounts of console IO that the actors were making were causing it to perform worse than Scala. Mike was kind enough to take a look at the Jetlang code, and he suggested that the excessive amounts of console IO that the actors were making were causing it to perform worse than Scala. ... This week, I provide the updated code for Kilim and Jetlang, and code to work with Actor's Guild and ActorFoundry, and provide the elapsed time comparison between these frameworks (as well as the Scala examples from last week). News Page from New York Times WASHINGTON — Despite the huge sums the federal government is spending to aid banks and stimulate the economy, President Obama said on Monday that his administration will slash the federal budget deficit, in part by ending the “casual dishonesty” that has accompanied Washington budgets of late. One such bad habit has been “the casual dishonesty of hiding irresponsible spending,” Mr. Obama said, citing the Bush administration’s technique of “budgeting zero dollars for the Iraq war — zero — for future years, even when we knew the war would continue.” ... WASHINGTON — Despite the huge sums the federal government is spending to aid banks and stimulate the economy, President Obama said on Monday that his administration will slash the federal budget deficit, in part by ending the “casual dishonesty” that has accompanied Washington budgets of late. ...The president said that the bank-rescue plan and the broader economic stimulus program are necessary not merely to jolt the economy but because the country has “long-term challenges — health care, energy, education and others — that we can no longer afford to ignore.”...“But I want to be very clear,” he said at a White House economic conference involving legislators, business and labor leaders and others. WASHINGTON — Despite the huge sums the federal government is spending to aid banks and stimulate the economy, President Obama said on Monday that his administration will slash the federal budget deficit, in part by ending the “casual dishonesty” that has accompanied Washington budgets of late. ... The deficit is the year-by-year gap between what the federal government spends and the revenue it takes in. Page Explaining Naive Bayes For classification, we want to determine P (H|X) -- the probability that the hypothesis H holds, given the observed data record X. For example, the probability that a fruit is an apple, given the condition that it is red and round. Suppose your data consist of fruits, described by their color and shape. However, bias in estimating probabilities often may not make a difference in practice -- it is the order of the probabilities, not their exact values, that determine the classifications. P (H|X) is the posterior probability of H conditioned on X. For example, the probability that a fruit is an apple, given the condition that it is red and round. ... P(X) is the prior probability of X, i.e., it is the probability that a data record from our set of fruits is red and round. So far, I have been deliberately dealing with plain text pages in order to keep things simple. However, the use case that prompted this work has to do with generating summaries for HTML pages. In the past, I have built a HTML parser using Jericho as part of another simple-minded summarizer that pulled web-page metadata to generate summaries, which I plan to extend and reuse. My Lucene Summarizer seems to work decently, but I personally like the results from OTS and C4J better. However, this may be somewhat subjective, and could be the result of my own bias. I think the theory behind the application is sound, but perhaps I need to either play with the tuning parameters a bit more, or add extra heuristics to make the results better. If you have done similar stuff before, I would love to hear suggestions about how this can be improved. Update 2009-04-26: In recent posts, I have been building on code written and described in previous posts, so there were (and rightly so) quite a few requests for the code. So I've created a project on Sourceforge to host the code. You will find the complete source code built so far in the project's SVN repository. This is a great article. Thanks a lot. Great article. Did you have a look at IBMs approach with "Many Aspects" (http://www.alphaworks.ibm.com/tech/manyaspects)? @Berlin: you are welcome, and thanks. @michael: thanks, and thanks for the link, will take a look. Hi sujit, I tested your application. However I get the output code phrases. How can I view the sentences of the summary and not the id? "Hi sujit, I tested your application. However I get the output code phrases. How can I view the sentences of the summary and not the id?". I am not sure what this means...the output of the summarize() method is a String, which is built out of sentence entries out of the in-memory Lucene index. Hi sujit.. please ignore the last messgae i sent you.. got the constructor problem sorted.. however my output of your system is just a few alphabets.. why does that happen?am i going wrong somewhere? Hi, you should get sentences as your output. You may want to check what sentences make it into the Lucene index, perhaps there is a problem during sentence construction? Hi Saranya, I used IBMs RBBI class for paragraph tokenization, which is driven by the config file in the post - looking back, I think the RBBI configuration is pretty complex and most of it was trial and error. I would suggest using regular Java tokenization instead if that works better for you - simply replace the paragraph tokenizer with your own (you know, maybe just tokenize on \n\n). Hello, this article is very helpful but i wanna filter data to get top term, because data which is get from topterm code are containing words such as are,is,the,a,and etc.And i want to filter that words(stop words). This case is use to make analyzing data like klout. Thanks for your advice, hopefully i can get solutions. Hi Aldy, yes, this is a great observation, thanks! The top terms are likely to contain many stopwords - so these should be filtered first. Dear Sujit, I have read this poster gives me a greate help on my research. As I am new in this field, would you please guide me in detail how can I run "Paragraph Tokenization" as Self-reliance java program? i am unable configure this project in my system. Can u send me this project in zip format. This help in my research work. i am new to this field and i am not able to configure the code. So if possible, can you give me a link from which i can download the complete source code? It will be of great help! do you happen to have a version of the lucene summarizer that is using lucene 4.0 and above? i tried converting your codes to suit lucene version 4 but having difficulties. thanks in advance. I have been trying to tokenize text that I have extracted from PDF files using apache Tika. When using the latest version of ICU4j (the referenced version in you pom file doesn't seem to work) I only ever get 1 paragraph returned. Tokenizing sentences does work as intended though. I've had a look at the rules but cannot see why this is failing. Any idea why thi9s might be? @Anonymous#1 (reply to comment dated 6/21): No I don't, sorry. Have yet to start working on Solr/Lucene 4.x, we are currently supporting 2 versions 3.2 and 3.5. @Anonymous#2 (reply to comment dated 6/23): I haven't used Tika (yes I know, strange but true :-)), I do plan to look at it soon for something. hi...can you please mail me the complete source code for this summarization system.....n please specify system reqirements...and how to run the project in a windows vista system to get the output summary...???? Hi, source code is in jtmt.sf.net (this code /and/ other stuff), system requirements should be modest, when I wrote this, (I think) my laptop had 2GB RAM. Its in Java so as long as you have Java running on your Vista box you should be fine, and I believe you can deploy Lucene there as well. You can either run as I did in this post using JUnit tests, or write your own main method. Hi, the idea is described in the post. Given a block of text (in your case it will come from the speech to text converter), split them up into sentences, then create an in-memory Lucene index for the document, one record per sentence. Then find the top N1 terms in the index, and make another OR query with these terms. The top N2 sentences (in sentence order) is your summary. You will need to choose N1 and N2 based on trial and error of what works best. In your case, you can probably skip the skim stuff since there are not going to be paragraphs. This post is fairly old and Lucene/Solr APIs change quite a lot, so its very likely that the code in here will not work with current Lucene versions. But changes are well documented and quite easy to find on the Internet, you should have no problem converting it. Sorry about the delay in replying, I haven't been looking at my comment moderation queue lately and missed yours. I guess you can use other indexing libraries - is there any particular reason you can't use Lucene? To contact me, comment using your email address (I wont publish it) and I can send you an email to start the conversation. Dear Sujit, thank you for this nice post. I was looking for something like this. Looks like my rule input is not working fine. I exactly copied your paragraph and sentence rules. Thanks for the kind words Pramod. I am guessing from the output that the tokenization is not happening correctly, instead of breaking sentences into words it is breaking it into characters. Check the behavior of the analyzer, that is most likely the problem - the article was written using a much older version of Lucene than what you are probably using and Lucene is a fast moving project, its very likely the behavior has changed for some component across releases - to test try replacing the StandardTokenizer and Filter with something more predictive such as WhitespaceTokenizer and Filter and see if you get better results. If this works, you should look at updating your analysis chain according to the latest Lucene guidelines. Hey, Im getting this error.. what am i supposed to do? Not sure, its been a while since I wrote this. Maybe try removing the comment lines (starting with #). Perhaps whatever is throwing the parse error doesn't know how to handle the comment lines? Hi, what version of libraries Lucene you used? Thank you for the information, 92wembley92. Its been a while so I don't recall the Lucene version exactly, but based on the timeline, it should be Lucene 3.x.